The BrosFuture action camera records in 4K, which is great – but I highly recommend using it mainly for 1080P recordings. The reason for that is the fps (frames per second) rate. When choosing 1080P – you can enjoy 60fps, which makes the videos smooth and clear. Of course that from time to time you can also use the 4K option – the quality is still good. I do want to mention that recently Xiaomi (a well known company) released a new model – YI Lite (Amazon link) which provides a little bit better quality at 1080P and 4K. Another great action camera worth checking out is AKASO EK7000 (Amazon link). This model is very popular (more than the BrosFuture 4k action camera to be honest) and provides great value for your money. The video quality is pretty much the same as the BrosFuture 4k action camera, but there are small differences. Check both cameras and see which one you like more. All you need to do to pair this camera to your smartphone is download an app – XDV (Android or iPhone). It’s free and using it you will be able to control your BrosFuture action camera from distance. This can be done since this camera has built-in WIFI. As I mentioned – it’s very easy to pair, takes less than a minute. The WIFI signal is pretty good – up to 10 meters of range. The stability of the WIFI is great as well – no random disconnects or lags. Currently (27/09/2017) – the BrosFuture 4K action camera comes with 2 batteries. Each one lasts 40-90 minutes, depending on video quality, if the wifi works and other factors. Not too many action cameras in this price range come with 2 batteries. Most companies want to earn more money, so they sell the additional, spare battery – separately , and in most cases – it’s not cheap. 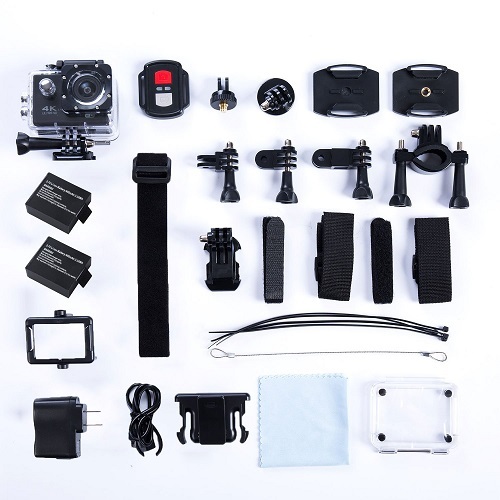 This action camera comes with different accessories and mounts. Using them you will be able to attach your BrosFuture sports camera to almost anything – for example, your helmet. You also get a waterproof case which installs easily. Using it you will be able to record videos underwater as well. 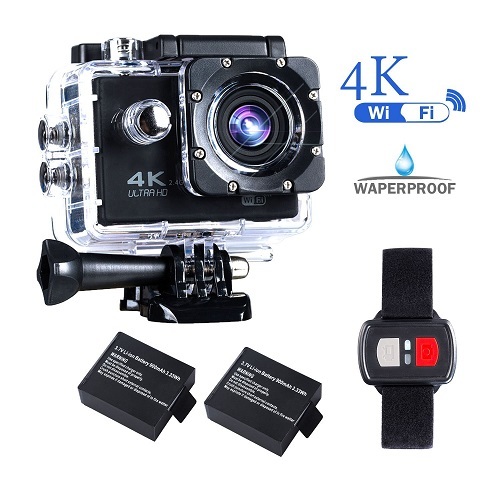 If you are looking for a reletevly cheap action camera with excellent video quality which is also very easy to use and has features like WIFI – buy the BrosFuture 4k action camera without thinking twice. I hope my BrosFuture 4k action camera review was useful. If you have any questions about this device – feel free to comment below. Also, make sure to check out other action camera reviews on our website. One of them which I really recommend is YI Lite review.